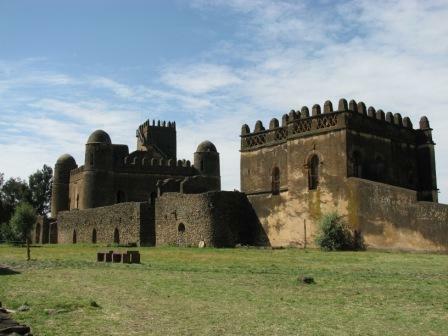 The fortress-city of Fasil Ghebbi is located in the city of Gonder which was the imperial capital for over 200 years. It was built in the 16th and 17th centuries by King Fasilides and his successors. Known as The Royal Enclosure, the compound contains well preserved castles, palaces, a banquet hall, library, lion house and other buildings, the Gonderian architecture displaying Arab, Hindu and European influences. Nearby in Gonder lies Debre Berhan Selassie, a beautifully preserved 17th century church, and Fasilidas's Pool, which is filled with water and worshippers every year during the Timkat Festival. Organised group tours: Click here to see 10 tours to Ethiopia Historical Circuit which may include Gonder.